As we prepare for our years of circumnavigating, we realize that we need to prepare carefully to handle not just expenses, but also money transactions, and especially how to have access to use our money to pay for things when we need to, and keep our banking, investment and financial accounts and records safe, secure and accessible at all times. One thing I strongly recommend is contacting your bank and credit card companies before you leave to let them know your travel plans, so they don’t decline your transaction when you attempt to use your ATM or credit cards in the foreign countries you’ll be traveling through. Also, get the local customer service numbers for each country, or the way to call the US representative from the foreign countries you’ll be in….before you leave the U.S.A.
Wireless identity theft is when the thief picks up your personal identifying information without physically touching your property, but by using radio frequency(RF) mechanics or some other non-physical means. U.S. 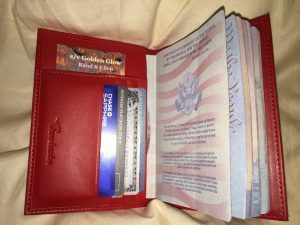 Passports and most credit cards are RF-enabled. Various metals can block RF transmittal, so we use special RFID-blocking wallets that have lightweight metal linings and they work very well. Our choice is the RFID wallet, pictured to the right = > which is available on Amazon – http://amzn.to/2kNY4Ob for only $7.99. This blog illustrates with pictures how sophisticated card skimmers can be in the devices they put on top of otherwise legitimate card machines at ATMs, gas pumps, etc. https://krebsonsecurity.com/all-about-skimmers/ With card skimmer devices being so hard to spot, how do you stay safe? First, never use an ATM that is free-standing. Look for one inside a bank, or at least inside a secure-access vestibule of a bank if you can find one. Cover the keypad with your other hand when you are entering your PIN number. Don’t click on links in emails without verifying with the sender (in a separate email you send) that they truly sent you the link. Schwab has an FDIC insured online bank account with $0 monthly service fees and a $0 account minimum that offers ATM banking with $0 ATM charges. Unlimited fee rebates from any ATM worldwide. Free standard checks and a Visa Platinum debit card once the account has been funded. Credit cards will only send a replacement or the renewal card to the billing address of record. If that’s not where you are on your boat, you’ll have to make arrangements to have the credit card received there, authorized and then fedexed (our recommendation) or mailed on to you wherever you are. No matter how much you prepare, things can go wrong, as this blog post by Meri Faulkner illustrates. Meri did everything right and tried to anticipate and plan ahead and take precautions. She was only using her ATM and credit cards in normal, customary, responsible ways. And when she needed access to her own money from the banks and credit card companies with whom she was on good terms, they couldn’t charge or withdraw her own money. Yikes! I could easily see this happening to us, and I want to prevent it from ever happening. Aside from carrying large amounts of cash on board (with obvious risks), I don’t see how to avoid this possibility on a multi-year circumnavigation. Please share your thoughts or suggestions to avert banking/credit card problems.